The holiday is approaching and I know some of you are looking to buy a new sewing machine. 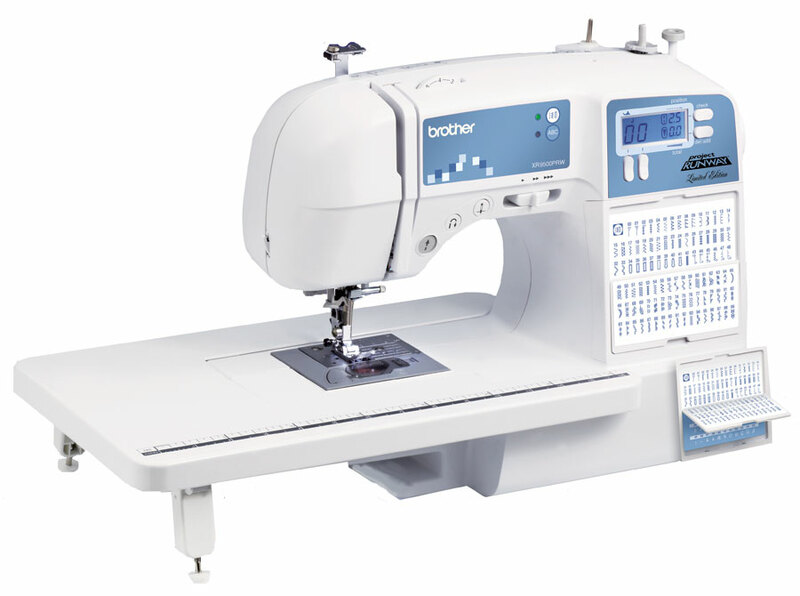 Nearly two years ago I purchased the Brother XR9500PRW Limited Edition Project Runway Sewing Machine and now I can give you an update on my purchase. I spent hours comparing the features and details of some of the Brother sewing machines to ensure that I choose the right one. I needed a machine that would handle bulky fabrics when I made handbags and I thought that I may give quilting a try too. I was still a little skeptical, but after discussing my needs with my auntie (the master seamstress) forced me to really think about what I was going to sew (handbags of course), what problems I had with my old machine, and what features I thought I may need in the future. She was absolutely correct! The oversized removable quilting table comes in handy for my large tote bags and when you remove the table you have a nice free-arm to wrap a tote bag around that gives you the freedom to control the tote bag as you make your finishing seams on the top of the bag. I thought the quilting foot would help me finish all of the bulky handbags, but I found that I didn’t need it when I used the little black button that keeps the presser foot level. I did use the quilting foot once to try a quilting technique on a handbag and it worked nicely. The computerized control panel with stitch selections and buttonhole stitches are automatic. No oil needed – The instructions suggest vacuuming the feed dog and bobbin casing to remove thread strands and debris. I try to do this twice a year. The automatic start and stop sewing button does the trick so there is really no need for the foot controller – I don’t use the foot controller anymore. Monogram projects are simple and easy to create and once you program a name it stops automatically on the last letter. Monogram font is one style and one size approximately 1″ inch. There is only one negative point for me, and that is the lighting that comes with the machine. It’s not as bright as I would like, but I can’t see as far as I used to see either. I have a sewing lamp to help me see. All in all I’m very satisfied with the Brother XR9500PRW. Since I decide to write this post I also noticed that the cost of this machine is now half the price I paid two years ago. And I would buy it again! Now I’m researching the Brother Embroidery machines to add to my wish list this year! I hope this was helpful and you can read more about my first impression in my first review… Happy Sewing! Stay tuned for more creations from LaCartera. I have a Brother embroidery machine too, don’t remember the name, it is about 8 years old and it is a very good machine too. I love my Brother! I found that some of the embroidery machines work with a larger embroidery space than others. Do you remember the largest hoop size you can use with your machine? I don’t know the largest size, because I haven’t used time enough to learn all the functions yet.